This paper summarizes recent advances in knowledge, and outlines areas for future research. It begins by describing what has been learned about the direct links between monetary deprivation, children’s physical development and well-being, and later socio-economic success, and describes a related body of research on the efficacy of the safety net. It then moves on to discuss the mechanisms that lie behind these relationships. The evidence in recent years overwhelmingly indicates that the major established federal safety net programs that boost income, target better nutrition and increase access to health care, have substantive effects on children’s short and longer term well-being. Increases in family income through the Earned Income Tax Credit have positive effects on children’s well-being. A 2012 study found that a $1,000 increase in family income raises a child’s math and reading test scores by six percent of a standard deviation. A 2015 study found that the same increase in income reduces the probability that a newborn is below the low birthweight threshold by 2-3 percent. Both academic achievement and birthweights are predictors of later economic success. Other safety net programs provide in-kind benefits but act somewhat like income enhancements because participating families can preserve more of their income for other needs such as adequate housing and clothing. The Supplemental Nutrition and Assistance Program (SNAP; formerly the Food Stamp Program) and the Women Infants and Children (WIC) nutrition program are two examples of such programs. These programs have also been shown to have impacts on children’s short and longer term outcomes. Recent research has generated overwhelming evidence that safety net programs aimed at improving disadvantaged children’s nutrition make a difference to their long term chances for success. For example, a study from 2011 estimates that for infants born to women with less than a high school education—children who generally have the lowest chance of escaping poverty—WIC increased birthweights by between 23 and 38 grams. Natural experiment methods have also recently been used to evaluate child nutrition programs such as the National School Lunch and Breakfast programs. A 2010 study finds that a 10 percentage point increase in program exposure predicts increased completed education by a third of a year for women, and nearly a full year for men. A 2015 study finds that at schools that provide meals through the School Breakfast Program math achievement increased by an average of 2.2 points and reading achievement increased by 2.0 points. Most studies find that more generous provision of public health insurance for disadvantaged children improves their health. Recently, with access to large datasets that include detailed information on adult outcomes, researchers have been able to confirm that these child health investments have long term effects on adult economic outcomes, and that they are cost-effective. The potential for reducing later government expenditures by investing in children today should be kept in mind when evaluating any program that is intended to improve children’s life chances. The effects of growing up in poverty may be contingent upon its timing and duration. The earliest years of life – the prenatal period through the preschool years – are often described by psychologists as a sensitive period, a time during which children may be particularly vulnerable to the effects of poverty due to the very rapid growth of multiple neurobiological systems and the establishment of foundational social relationships with caregivers. Recent work in psychology indicates that early adolescence constitutes a second sensitive period. There may also be critical periods, or specific windows of development during which exposure to poverty will have irreparable effects on some aspect(s) of functioning and development. In addition to being a sensitive period, the prenatal period is also believed to be a critical period. A mother’s experience of severe stress during pregnancy may result in fetal programming, or changes to the unborn child’s developing brain and neural systems that alter how the child reacts to events and situations in the future. Two large scale interventions that target early life are WIC and Head Start. In the short term, Head Start appears to increase students’ average cognitive test scores, but these average gains “fade-out” in elementary school. Research suggests that the program, and others like it, build social-emotional skills that do not immediately transfer to achievement scores, but are important determinants of later life outcomes (including academic success). Economic stress has negative effects on both men and women, contributing to increases in mental health problems and marital problems. Research finds that family economic stress is associated with depression and anxiety in parents, higher levels of marital conflict, and less nurturing parenting. For children, these factors heighten the risk of conduct and other problems that impact subsequent educational attainment, employment, and their own parenting practices as these children grow up. Research is now able to document that these processes associated with the intergenerational transmission of poverty often parallel each other across generations. Community influences may also contribute to poverty across generations. Low-income families are more likely to live in neighborhoods with lower quality schools, lower quality infrastructure, and compromised safety. The quality of local resources may be particularly important to low income families because they are more dependent on public education, public transportation, local health clinics, and social services for the essentials of daily living. In addition, it has long been surmised that communities may influence children’s development through less tangible factors such as peer influences, or role-modeling and enforcement of social norms by adult residents. Higher levels of neighborhood disorder are correlated with more fear for safety, higher levels of parental stress and more family conflict. Emerging research is also making clear that the influential role of place in poor children’s lives may not be restricted to urban neighborhoods with high concentrations of poverty. Rural poverty and urban poverty present unique place-based challenges related to service access, educational resources, and employment opportunities. Recent research has found that low-income children who move to higher-income commuting zones have better long-term outcomes in proportion to the time that they spent in those neighborhoods. Taken as a whole, a rapidly growing literature is quickly establishing that childhood poverty is significantly associated with all levels of neurobiological functioning. When these components of neurobiology are compromised, it can impede one’s mental and physical health, ability to learn and work, and capacities for engaging in healthy social relationships. During childhood and adolescence growth and refinement of neural connections in the brain are established and reinforced. Childhood poverty has been associated with variations in both the structure and function of brain regions related to memory and cognition including the hippocampus, a part of memory and learning from context, and the prefrontal cortex (PFC), which supports the ability to exert self-control over one’s thoughts, emotions and behaviors. Lower perceived socioeconomic standing is associated with reduced PFC volume. The extent to which individuals perceive themselves to be economically disadvantaged may even matter more than their actual financial resources. This suggests that an individual’s subjective experience of the meaning of her socioeconomic position in society may also have effects on neurobiological development. The HPA axis (or adrenocortical system) produces hormones that are carried by the circulatory system and trigger physiological effects throughout the body and brain. The HPA axis hormone that has received the most study is cortisol, which is a vitally important hormone for normal, healthy functioning, including the mobilization of energy resources that support focused attention and effective coping behaviors. Low levels of cortisol (hypocortisolism) and high levels of cortisol (hypercortisolism) have both been linked with poorer academic and occupational performance and more mental and physical health problems. Hypercortisolism may damage brain tissue, whereas hypocortisolism may reduce focused attention and effective coping. Children growing up in low SES families are more likely to have these atypical cortisol levels, which in the short- and long-term can undermine their well-being. The ANS serves as the rapid communication channel between the brain and the body, producing effects on heart rate, blood pressure, respiration, perspiration, digestion and numerous other physiological processes within fractions of seconds. Prolonged reactivity to the stress of poverty produces cumulative wear-and-tear on the circulatory system, which may compromise future cardiovascular health. Several recent studies have documented that adults who grew up in low SES families are more likely to have elevated blood pressure, which is in turn associated with increased risk for the development of hypertension and cardiovascular disease. A 2013 study found that adolescents who lived in low SES households as children have prolonged blood pressure reactivity to acute challenges—in other words, it takes them longer to recover from a stressful event. The immune system is comprised of a complex network of cells, tissues and organs distributed throughout the body that serve to protect the body from infection by pathogens. One of the primary responses to cell damage caused by infection is inflammation. While inflammation is necessary to the recovery process, it is a key feature of many of the illnesses that are prevalent among the poor, such as cardiovascular disease, diabetes and obesity. Children and adults living in lower SES conditions are more likely to experience chronic inflammation. This could increase susceptibility to acute infections and chronic diseases. Even when children are able to break the cycle of poverty by achieving better economic outcomes in adulthood, they may be unable to fully escape the long-term impacts on their health. Our genes are responsible for regulating cellular and neurobiological functioning through the gene expression (protein synthesis). External events can change the nature of the protein synthesis by a particular gene. For example, genes that generate the body’s stress response might be altered through stressors associated with not being able to make ends meet. There is growing evidence that the experience of living in poverty alters gene expression. Childhood socioeconomic disadvantage predicts both increased and decreased expression of several hundred genes, suggesting that childhood poverty has the potential for profound and widespread effects on biological functioning and behavior. Allostasis describes the body’s ability to adapt to the continuously changing demands of our complex social and physical world. It is essential for adaptive behavior and good health. Allostatic load is the loss of such adaptive physiological flexibility due to the wear-and-tear of chronic or severely stressful life experiences. Individuals who live in lower SES contexts have higher allostatic load, meaning that their bodies are less able to withstand the biological wear and tear from daily stress. Children with higher allostatic load have relatively more emotional and behavioral problems, and are in poorer physical health. Poverty and lower SES in childhood and adolescence appear to have direct and adverse effects on neurobiological development that are still evident in adulthood. It is clear that, relative to children growing up in more advantaged families, poor children have lower self-esteem, and that they are more likely to have symptoms of depression. Poverty may affect whether they perceive themselves as competent and valued individuals, which may in turn affect their behavior in ways that compromise their ability to succeed. Although children from poor families are often optimistic about their future prospects, they generally have lower career aspirations than children from middle-income families. Children adopt social values concerning differences between rich and poor from as early as four years old. Young children may not perceive income-related social categories as flexible and changing. As a consequence, they may be more likely to believe that someone in poverty will always be so and will pass on their poverty status to their children. Increasing family income boosts both short-run measures of child well-being and long-run labor market and health outcomes. Programs that increase income, like SNAP and the EITC, are likely to be cost effective because the associated later improvements in health and earnings substantively reduce later public expenditures on welfare and health care. This includes nutritional interventions such as WIC and the Free and Reduced Priced School meal programs, early life educational interventions such as Head Start, and access to health care through publicly provided insurance (i.e. Medicaid). A caveat is that many of the best studies to date have, by necessity, been based on analyses of these programs as they existed prior to the 2000s. Programs aimed at improving the neighborhood environment, like the Harlem Children’s Zone may hold promise. The importance of place is not uni-dimensional. Poor families living in rural areas face a very different set of challenges from those living in poor inner city neighborhoods. Parental depression and anxiety, marital conflict, and compromised parent-child relations are correlated with many measures of child well-being and later life success. Two-generation interventions targeting parental behaviors that are believed to be affected by the stress associated with living in poverty may help to reduce this pathway. Future research should focus on further combining new data opportunities with creative quasi-experimental approaches to understand which children benefit most from income boosts, and why. 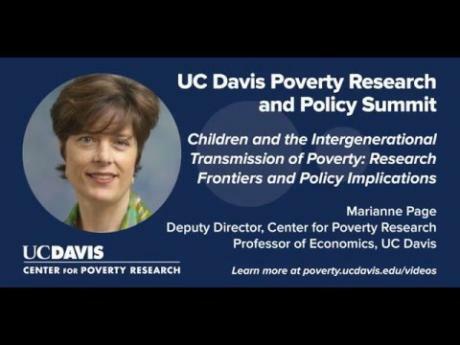 We are also well poised to apply these advances towards understanding when in children’s developmental trajectories exposure to poverty and its associated correlates matters most, and the relative importance of timing vs. cumulative exposure. It is important for evaluations of current state of programs such as WIC and the Free and Reduced Priced School meal programs, early life educational interventions such as Head Start, and access to health care through publicly provided insurance (i.e. Medicaid) to understand which children benefit most from these programs, and why. Future research should also aim to better understand how the different and distinct programs that fall under the safety net interact with each other, and the extent to which these interactions compound (or detract from) the observed benefits. In order to design the most effective interventions, however, we need to know which neighborhood characteristics matter most, and for whom. The research advances that have been made over the last decade will help us move towards answering those questions. The influence of place on children’s long term outcomes is not likely to be captured in easily observed, standard measures of disadvantage such as the fraction of adults that are unemployed, or the fraction of young men who are incarcerated. We need to invoke more thoughtful measures of context in order to better understand the nuanced effects of place on children’s life chances. Existing research, however, makes clear that we cannot expect a one-size-fits-all approach to targeted community interventions to be very effective. Children are particularly vulnerable in early life. Research also points to adolescence as a particularly sensitive period of development, which opens possibilities to foster positive changes in health, well-being, and later life outcomes at multiple points in development, not just during the “zero-to five” period of early life. Poverty impacts children’s thinking and sense of self, and contributes to the poor educational attainment and diminished employment prospects that helps to keep children from moving out of poverty when they move into adulthood. There is promising research on interventions that can improve these consequences of poverty, but much more research is needed. Poverty is associated with the development of neurobiological functioning at every level throughout the body, and we know that many of these aspects of neurobiological functioning predict children’s subsequent development. Future research should investigate the extent to which interventions can normalize neurobiological processes that have been dysregulated by influences associated with poverty.